I wouldn’t say Grosvenor Arch was on my bucket list but it’s certainly been on my Utah To Do list for many years. 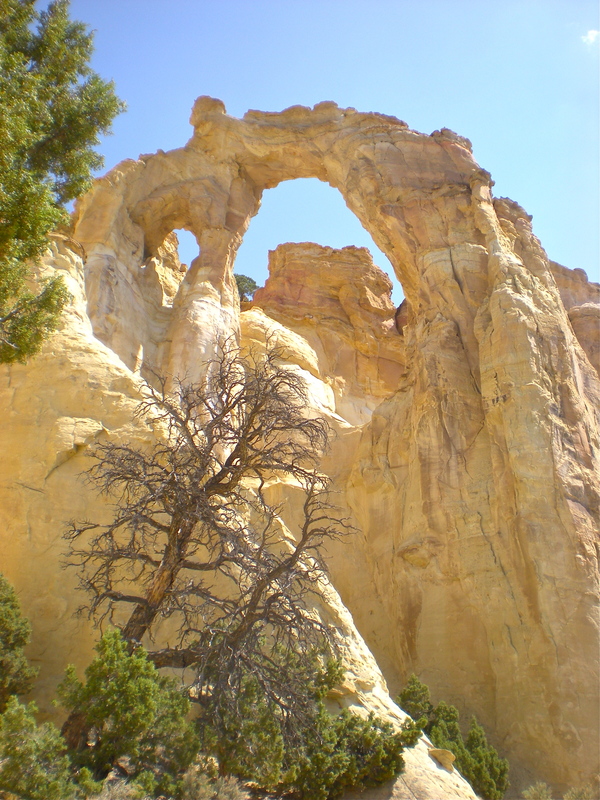 Photos of the double arch are frequently seen in articles, videos and guidebooks and it’s had a certain appeal for me. One reason probably is because it is in the backcountry, not near a highway viewpoint. 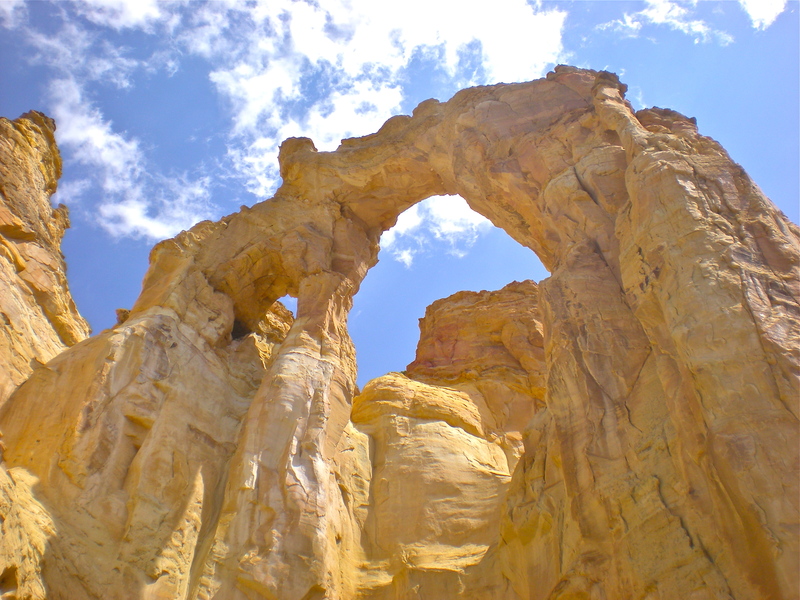 The arch stands 19 miles south of Cannonville, Utah, down Cottonwood Creek Road. The road is paved the first nine miles to Kodachrome Basin State Park, from there it’s 10 miles of rock and dirt. 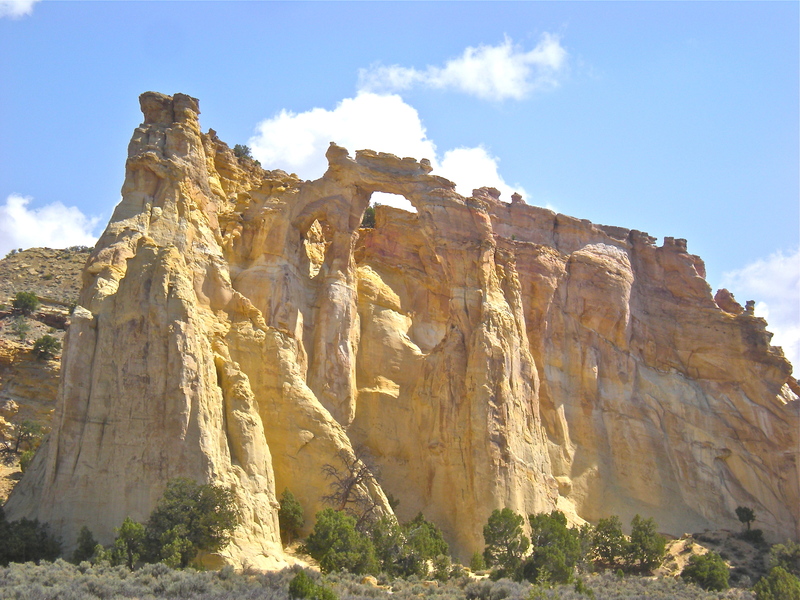 I enquired about road conditions at the Grand Staircase Escalante National Monument Visitor Center and was given very actuate details. In fair weather a high-clearance, two-wheel drive car would have no trouble. There is some washboard but not the entire length. The road dips in one location that usually holds standing water, with a choice of two crossings I was advised to take the one to the right which is less steep. One mile before the arch a forest service sign marks a left turn. At the parking area we find an information sign, pit toliet and paved walkway making it wheelchair accessible. We were the only visitors all of the time we scrambled around taking photos from different angles. Grosvenor Arch was named after a former president of the National Geographic Society, Gilbert Grosvenor. It stands 152 feet tall with a 92-foot span. The remote setting adds to the drama, I was not disappointed and thought the 40 mile round-trip worth it. Check!